Share the love of reading with a self-published children's book full of vibrant color and the perfect trim sizes for young readers. What Does the Average Children's Book Look Like? 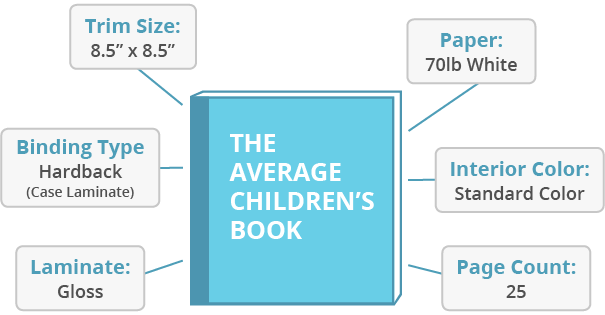 Check out the most commonly used specifications for children's books published with IngramSpark. *Print fee is based off of specs listed in diagram. Use our print and ship calculator to determine the actual cost for your book's particular specifications. Find the perfect trim size for your self-published children’s book, from big picture books to small books for small hands. Create a more enjoyable reading and learning experience with vibrant colors that immerse young readers in your story. At the playground, in the playroom, or snuggled in bed, our bindings help your children’s book go more places. Want to build hours of additional enjoyment into your children’s book? Print-to-ebook conversion adds a new level of interactivity to your story. When you self-publish your ebook with IngramSpark, your book is connected to major online retailers serving young readers and budding imaginations around the globe. Wrangling little ones can be hard. At least with IngramSpark you don't have to wrangle multiple contracts. Amazon, B&N, Apple, Nook, Kobo, and more under one roof. Ready to bring your children's book to readers worldwide?